VNCtalk specializes in providing services for real time communication and it includes several components. In minimal installation a Zimbra environment and a single additional server (the Talk server) are required. At the moment the only supported platform for the VNCtalk backend server is Ubuntu Ubuntu 16.04 (64bit). The VNCtalk system enables its users to perform text chat, text conference (groupchat), video chat & video conference as well as online document collaboration between the participants of a VNCtalk session, using Zimbra Zimlet technology. Google Chromium >=70.0 will also work on most operating systems, except Debian Testing due to Debian specific changes in the sandbox handling1 . Mozilla Firefox ESR is also supported, when using VNCtalk version 2.4. as well as FireFox Quantum. A functional webcam, microphone & headphones are also required for video conferencing. Another limitation is the bandwidth which is available for the user. If many users, e.g. more than 6 users, are using the videochat application at the same time, the complete uplink and downlink bandwidth of a slow Internet connection (<= 16000Mbit/s) could be saturated, affecting the quality of the conversation. Having a contact list/ roster containing more than 100 contacts setup for an account, might also impact the performance, so keeping the user's contacts in the list below 100 is advised. root access to the Zimbra- and VNCtalk server. In case you do not have a proxy running, follow the steps described in the Zimbra-Wiki, on how to enable the proxy: Zimbra-Wiki. VNCtalk heavily relies on DNS resource records and TLS. The certificates used at the Talk server must be valid and cover all required names. We recommend using a wildcard certificate here. Warning: we had to split the command into multiple lines to make it readable, but you should keep it all on one line, otherwise you may lose some subject details. For better certificate management, put the key and crt files into the folder /etc/ssl/owncerts. You need to provide the TLS key and the TLS certificate. The certificate file must also include the complete CA chain! Note 1: Please do not use a certificate with a password2. Note 2: You may also order a LetsEncrypt-certificate covering the domains listed above as well. This Zimbra-Wiki article describes, how to install a LetsEncrypt SSL-certificate on Zimbra. For the talk-server you need to provide the privkey*.pem and fullchain*.pem files when prompted for them during the installation process. Please make sure that you create a dedicated SSL-certificate for the talk server. Please note: The server has to be accessible using the same hostname + port combination from Zimbra servers as well as from clients. If you are using NAT and split DNS you have to make sure your DNS settings are correct, otherwise the application will not work! During the installation of the Talk server, the installer will ask for several settings and information about your Zimbra and network environment. It is recommended to fetch this information now and copy it to a textfile for convenient usage later on. Execute all the following commands as user zimbra. Zimbra (and master LDAP) fully qualified domain (FQDN). The installer will check for additional settings and fetch these automatically. If any additional adjustments are required on your zimbra environment, the installer will provide the details for it. $ zmprov mc default zimbraProxyAllowedDomains "*yourdomain.tld"
Note: If you do not adjust the settings now, the installer will prompt you for it during the installation process. This section lists the required DNS entries for the VNCtalk components. The XMPP server is called xmpp.yourdomain.tld. This server serves the yourdomain.tld. So a user JID3 will be for example alice.doe@yourdomain.tld. The target domain (xmpp.example.com) must be an existing A record of the target server, it must not be an IP address, and cannot be a CNAME record. _xmppconnect.xmpp.yourdomain.tld. 300     IN      TXT     "_xmpp-client-xbosh=https://xmpp.yourdomain.tld:443/http-bind"
_xmppconnect.yourdomain.tld. 300     IN      TXT     "_xmpp-client-xbosh=https://xmpp.yourdomain.tld:443/http-bind"
_xmppconnect.external.yourdomain.tld. 300     IN      TXT     "_xmpp-client-xbosh=https://xmpp.yourdomain.tld:443/http-bind"
_xmpp-client._tcp.yourdomain.tld. 300     IN      SRV 0       5       5222    xmpp.yourdomain.tld. _xmpp-server._tcp.yourdomain.tld. 300     IN      SRV 0       5       5229    xmpp.yourdomain.tld. _xmpp-client._tcp.xmpp.yourdomain.tld. 300     IN      SRV 0       5       5222    xmpp.yourdomain.tld. _xmpp-server._tcp.xmpp.yourdomain.tld. 300     IN      SRV 0       5       5229    xmpp.yourdomain.tld. _xmpp-client._tcp.auth.yourdomain.tld. 300     IN      SRV 0       5       5222    xmpp.yourdomain.tld. _xmpp-server._tcp.auth.yourdomain.tld. 300     IN      SRV 0       5       5229    xmpp.yourdomain.tld. _xmpp-client._tcp.focus.yourdomain.tld. 300     IN      SRV 0       5       5222    xmpp.yourdomain.tld. _xmpp-server._tcp.focus.yourdomain.tld. 300     IN      SRV 0       5       5229    xmpp.yourdomain.tld. _xmpp-client._tcp.jitsi-videobridge.yourdomain.tld. 300     IN      SRV 0       5       5222    xmpp.yourdomain.tld. _xmpp-server._tcp.jitsi-videobridge.yourdomain.tld. 300     IN      SRV 0       5       5229    xmpp.yourdomain.tld. _xmpp-client._tcp.conference.yourdomain.tld. 300     IN      SRV 0       5       5222    xmpp.yourdomain.tld. _xmpp-server._tcp.conference.yourdomain.tld. 300     IN      SRV 0       5       5229    xmpp.yourdomain.tld. _xmpp-client._tcp.external.yourdomain.tld. 300     IN      SRV 0       5       5222    xmpp.yourdomain.tld. _xmpp-server._tcp.external.yourdomain.tld. 300     IN      SRV 0       5       5229    xmpp.yourdomain.tld. _xmpp-client._tcp.conference.external.yourdomain.tld. 300     IN      SRV 0       5       5222    xmpp.yourdomain.tld. _xmpp-server._tcp.conference.external.yourdomain.tld. 300     IN      SRV 0       5       5229    xmpp.yourdomain.tld. You can find real BIND and dnsmasq examples at the Appendix. While installing the base operating system, use the minimal installation and only add openSSH server to it. The installation process is initiated by running the installer script with root privileges. During the installation process, it will interactively ask for all required information and installs & configures all components afterwards. This will install quite a lot of dependencies and may take some time. Therefore we propose running the installation in a screen. Besides executing the installer script without parameters, which performs a straight forward installation, the installer can also be executed with additional arguments. sudo ./install-vnctalk.e78088b.sh -d: Executing this performs a dry-run of the installation, creating all the configurations necessary but not installing any package or performing any modification to the current system's settings. generated config for <yourtalkserver hostname>. Right before the dry-run is finished, the user is prompted whether he/she wants to let the installer check if DNS is setup correctly, which might take up to a minute to complete. Any DNS-errors found will be stored in the current working directory to the file dnserror.txt, enabling the user to fix any DNS-issues occured before applying the dry-run configuration later on using the -a argument. sudo ./install-vnctalk.e78088b.sh -a: Executable after a dry-run installation has been previously performed. Passing the -a flag will execute the installer using the previously entered input made during the dry-run and will not prompt for anything until the installation has been completed. Then the user is asked if DNS-setup should be checked again for correctness. 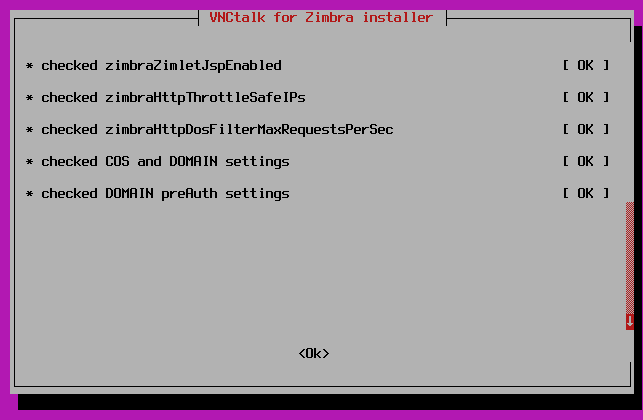 VNCtalk for Zimbra installation (nearly) done. sudo ./install-vnctalk.e78088b.sh -u: Removes the VNCtalk application and its dependecies from the talk-backend-server. This whole uninstall process along with the tasks to perform on Zimbra-side is explained in chapter Uninstall VNCtalk. After adding some additional package repositories and pre-installing some required components, the interactive installation process starts. locked mode: [YES] allows access to video calls only for zimbra users. External guests can not participate in video calls. open mode: [No] allows access to video calls for anybody. Once these details are provided, the installer checks for the required Zimbra settings and provides feedback about required modifications still pending on Zimbra side. In case anything is not setup correctly, in this example JSP has not been enabled on the Zimbra-Server yet, you will be notified with a FAIL instead. Now connect back to your VNCtalk installer screen. No for manually assembled contact lists: the users have to assemble their contact-lists and groups manually by themselves, starting with an empty roster but providing more freedom and options to them. Details about the pro and con of each mode are explained in section Using auto-generated contact lists. It is save to accept the provided default value here, since the default filter can be changed afterwards, as explained in section Using auto-generated contact lists. Now it is time to ready your SSL-certificate files. It is higly recommended to provide a valid commercial certificate. Using self-signed certificates can create weird and hard-to-debug errors, as these certificates will have to be imported into the Zimbra truststore as well as into all potential client systems. After pressing OK, you will be prompted in the next two screens to enter the path to the certificate's private key file and the SSL-certificate file. The installer will only accept valid key-files and certificates and will prompt you to re-enter the filepaths in case of an error is detected. Once this is done, the installer asks if the server is behind a NAT/Firewall. If you are using Split DNS answer Yes here5. In the next step, you are asked if you want to use the default virtual hostnames. These are the names mentioned e.g. in section Certificate Requirements. In most cases it is safe to answer ”Yes”. If you say ”No” here, the installer will prompt you for all the required virtual hostnames afterwards. you are then asked to enter the history retension time, meaning: How long should the chat history be stored? When OK is pressed, the remaining dependend packages are now installed and configured. Only one IP-address type is required to enter here. The other input field could be left empty. In case the answer was No in (8), the next two screens are skipped and the DNS configuration is created right away. When finished, you will get a notification. Now is the time to apply these DNS-settings. The details, which DNS-records do not match, are stored in the file dnserror.txt, located in the current working directory. 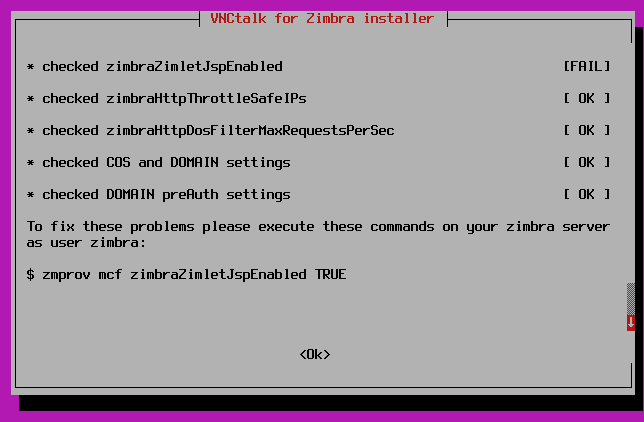 This section describes how to install and configure the VNCtalk zimlet on a Zimbra 8.6/ 8.7/ 8.8 environment. Provided Hostname/IP (<talk-server-IP>) is not reachable on Port 8080! So when continueing with y anyway, the required proxy-modifications will be applied correctly. Change to the extracted directory and execute the installer as user root. The install script will take care of all needed dependencies and will install these too. Please Note: Executing the install.sh shellscript, will trigger your system's package manager to initiate an update of your installed packages system along with it! and check whether zmpkg is installed or not by using the zmpkg list command. It may be required to add the http_proxy variable to the zimbra user's .profile or .bashrc files. update, upgrade, install, download, etc. All these commands must be executed as the zimbra user! to make the changes available to the ZCS. These commands use zmpkg to update the repository and install the VNCtalk zimlet. To make the changes available to the users it is required to restart all services.